When it is about Raja Ampat, people are likely to think about beautiful beaches and other natural attractions. Regardless of the type of tourist spots, travelers need to find the right resort for resting. For those visiting Kri Island, the most recommended one is Sorido Bay Resort. The location is in Yenbuba Village and it is more luxurious than its sibling, Kri Eco Resort. With the best amenities, the place becomes tourists’ choice when spending a holiday in Kri Island. At least, it can be a resting place before going snorkeling to the beach. Sorido Bay Resort is located near to the sea, so it offers stunning beach views. Some bungalows are even located in the tip of shoreline. That means the guests can relax while witnessing serene sea scenery. Next, there is a wooden pier and a nameplate, which becomes the guests’ favorite spot for fishing and witnessing sunsets. The resort also features shady trees, so the atmosphere is quite cool. No wonder all the guests would feel comfortable and relaxed there. Sometimes, songs of birds are heard, especially in the morning. 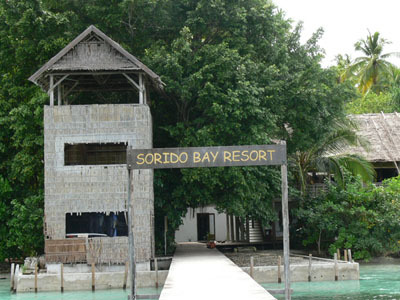 According to the owner, Sorido Resort was mainly built for honeymooners and divers. Once tourists get to the location, they can find 7 bungalows with the stunning beachfront scenery. The view is definitely fantastic, which is located near to a lagoon. Each of the bungalow features a courtyard, in fact. Thus, the guests would get a cozy and neat environment to rest. The size of the cottages is different, as well. This way, people can choose the one that suits their preferences. The resort also features a dining area, library, lobby, and other facilities! So, what can people enjoy near to the resort? Mostly, the guests may visit Kri Cape, which becomes the home of hundreds of fishes. The best activity is definitely diving, as the cape features amazing corals and reefs. The resort even offers dive packages to the guests, covering both beginners and professionals. Usually, the boats are available on 7 am. The service ends at 9 pm, though. The best thing is the resort provides boat transfer to the guests freely. It is available on Sunday! It is true most of the guests are looking for a new diving experience in Kri Island. In this case, Sorido Bay Resort becomes their primary option for accommodation. Once they rent a room and take a rest, they may start snorkeling in the next morning. Numerous fishes live in the sea near to the resort, including tuna, parrot fish, seahorses, etc. The visibility of water is excellent and the temperature is warm. A vacation to Kri Island is related to Sorido Resort. That means tourists should take advantage of such accommodation when spending a wonderful holiday in the island. First, head to Waisai City, where Marinda Airport is located. Next, take a speedboat from Waisai Port to Kri Island. The resort is situated near to the coast, so it is quite reachable.